New Jersey has had a tough life. Long lost in the shadow cast by the bright lights of the world’s largest city, New Jerseyites have to be a hardy bunch of people to survive. But out of this rough and tumble, blue collar lifestyle, some of the best and most quintessentially American rock musicians have emerged. And they take care of their own. After Hurricane Sandy hit in late October 2012, the Garden State’s native sons came back to do what they could amid the devastation and destruction of their beloved shoreline. Bruce Springsteen, along with fellow rocker Jon Bon Jovi and others raised money to help rebuild the state that made them who they were—both as musicians and men. 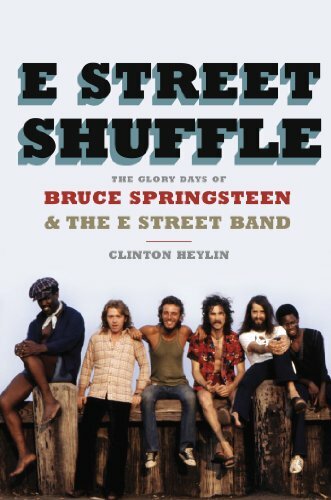 In his latest release, E Street Shuffle: The Glory Days of Bruce Springsteen and the E Street Band, author Clinton Heylin chronicles Springsteen’s musical journey. Known predominantly as one of the more knowledgeable, if not the most prominent Bob Dylan scholar, this English author’s new book sees him branching out to tackle another iconic American rocker. Since The Boss himself claims to have felt mostly dead until the age of 13 when he discovered the guitar, Mr. Heylin just briefly mentions Springsteen’s formative (and much chronicled) years in famed Asbury Park on the Jersey Shore, choosing instead to focus more on the life and death and resurrection of the notorious E Street Band. Originally formed in 1972, the E Street Band had a lot of casting changes over the years, including the additions of Max Weinberg on drums in late 1974 and Steven Van Zandt on guitar and vocals in 1975. The band officially broke up in 1989, but got back together in 1999, roughly 10 years after Bruce initially left to pursue his solo options. Mr. Heylin’s book takes an honest look at the band’s highs and lows using lots of first person observations and quotations. Sometimes the pace of the book gets a little bogged down, but the story is still solid. Nobody does blue collar America better than Bruce Springsteen, and even lukewarm fans will want to add Clinton Heylin’s book to the already storied cannon. The music has withstood the test of time—even if the road that created it may have proved a bit bumpy. If only the rest of us could be as successful in finding our paths.